The announcement of the Petrona Award Shortlist is always a bit of a sad time as I remember my friend the late Maxine Clarke. Maxine’s blog Petrona was an inspiration to so many, and she was one of a very small group of bloggers who spread the word concerning Scandinavian crime fiction at a time when very few had even heard of Maj Sjowall and Per Wahloo, or Stieg Larsson. This year’s shortlist looks very impressive with books from Norway, Finland and Sweden. 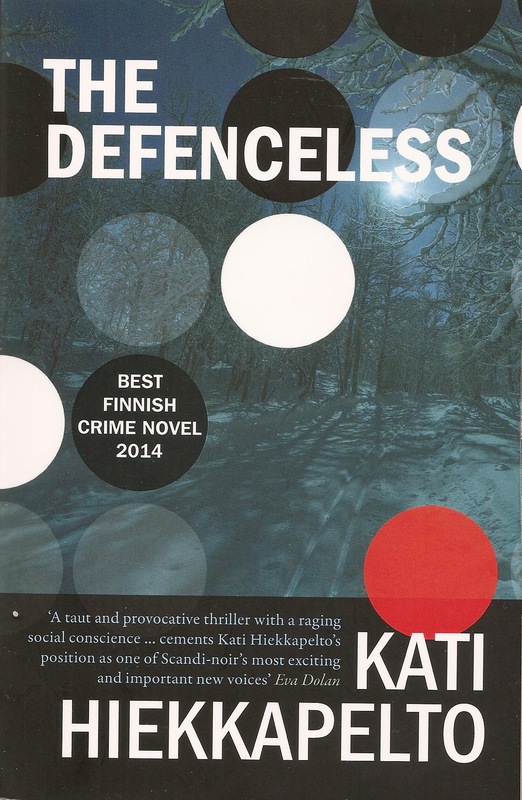 I have read two of these books Kati Hiekkapelto’s The Defenceless and Hans Olav Lahlum’s Satellite People and I enjoyed both immensely. I hope to read at least two of the others before the announcement of the winner at Crime Fest in Bristol. Last year for the first time I totally disagreed with the judges on their choice of a winner. I think that one important criteria for the award should be that the book that wins should be one that Maxine would have enjoyed reading. A few thoughts about the contenders. I noticed the Lagercrantz on a half price offer in our local Waterstones. I haven’t read anything about this book but my natural reaction, possibly misguided, is that the series should have ended with the death of Stieg Larsson, and that the original fans of the series may regard this novel as an exploitation. On a more serious subject when I met Karin Fossum at Crime Fest several years ago we very briefly discussed her social work with children with Down’s Syndrome. She is a charming lady and does know what she is talking about on this subject. After the drowning of a young child with Down’s syndrome, Chief Inspector Sejer must ask himself if one of the parents could have been involved. The nature of grief is explored along with the experience of parenting children with learning difficulties. This is a subject about which I know a great deal, but reading this novel in the circumstances might be too traumatic. In our case for the wonderful twenty seven years our son Jacob was part of our family we thought we were looking after him, but in reality he was looking after us. I have linked to my reviews of two of these books. I read two outstanding books from the USA in 2015. The heartrending The Secret of Magic by Deborah Johnson, which deservedly won the Harper Lee Prize for Legal Fiction, and Cop Town by Karin Slaughter, which won the CWA Ian Fleming Steel Dagger for Thrillers. Both were set in the South and dealt with racism, in all its ugly incarnations. And interestingly both had female leading protagonists, always a good start in societies, the Deep South 1946, and Atlanta police force 1974, where women were regarded with a degree of circumspection. An excellent reminder for devotees of Nordic translated crime fiction that there are still great books coming out of the USA. I read Cop Town because it won the CWA Ian Fleming Steel Dagger as the best crime thriller of 2015. Cop Town is a worthy recipient of the award that last year was won by the superb An Officer and a Spy by Robert Harris. Set in Atlanta in late 1974 the story begins as a search for a serial cop killer known as The Shooter. Jimmy Lawson’s partner Don Wesley has been shot and Atlanta’s police force is on the warpath to find the killer. Jimmy’s violent uncle Terry leads a group of cops who are determined to dispense their own brand of justice. Two policewomen begin their own investigation as something is not quite right about Jimmy’s account of the details of the shooting. The female cops are Maggie Lawson, Jimmy’s sister, and rookie Kate Murphy, a young women widowed by the Vietnam war. Maggie comes from a real blue collar police family, and Kate doesn’t. I won’t say any more because a large part of the interest in the story for this reader was the discovery of Kate’s background, and the gradual change in the storyline from a straightforward police procedural into a combative plea against homophobia, misogyny, and racism. Maybe there was a reason Atlanta was statistically one of the most violent, criminal cities in America. As far as Maggie could tell, the only thing black and white male officers could agree on was that none of them thought women should be allowed in uniform. This is a brilliant book with great characters, plenty of social comment, and a plot that is just complex and convoluted enough to keep the reader’s interest. Reading very good crime fiction can take the reader into a different environment, and allow you to forget even for a few seconds the terrible events taking place in a real world that frequently is more terrifying than anything thought up by a fiction writer. Icarus by Deon Meyer is yet another superb book set in modern South Africa featuring the troubled alcoholic detective Benny Griessel, and his colleague Vaughan Cupido. The story has two strands that come together very satisfactorily at the conclusion of the book. The major plot has the Hawks-the elite Directorate of the Priority Crimes Investigations, the DCPI- investigating the murder of high flying internet entrepreneur Ernst Richter. Richter’s company Alibi is notorious for arranging cover stories for people having affairs, which means the number of suspects who might want to kill him is quite high. Benny has fallen off the wagon after 602 days sober, because of a traumatic family murder suicide. His partner Vaughan Cupido, a Cape Coloured detective, has to take the lead in the investigation while covering up for his friend Benna. The subplot is set a few days in the future where wine farmer Francois du Toit narrates a family saga to Advocate Susan Peires in her chambers. Some readers might feel that this lengthy story of farmers, wine and rugby stars slows up the progress of the main narrative but I found it fascinating, and it helped build up the tension. Advocate Susan Peires SP: Please, Mr du Toit…..
F. du Toit FdT: Call me Francois…..
SP: No, I shall call you Mr du Toit. We are not friends; we are advocate and client. It is an official, professional relationship, for which you will pay me a lot of money. Immersing the reader into the atmosphere of Deon Meyer’s books is helped by the liberal, but not excessive, use of Afrikaans and some of the Rainbow Nation’s 10 other official languages, as well as township slang. Luckily there is a comprehensive glossary in the back of the book to assist the English speaking reader. Cupido’s efforts to find Richter’s killer are complicated by his attempts to get Benny to get his life back on track, and his strong feelings for the very desirable Desiree Coetzee, the beautiful Cape Coloured woman who in effect ran Alibi for Ernst Richter. The investigation becomes more complex as Alibi’s clients become concerned that their names would be revealed by someone who had obtained the database of unfaithful spouses. She told him about the pressure from above. She said the dude doing the database reveal had already exposed one ANC politician, one TV newsreader and a whitey former soap star. All the complexities of the case come together at the end. Benny continues to fight his alcoholism as his colleagues try to protect him, Cupido wonders if he can form a relationship with Desiree. With the interesting location in South Africa, the social commentary and with so many other characteristics that I want in a good crime fiction novel I can highly recommend Icarus. This is a series well worth following.